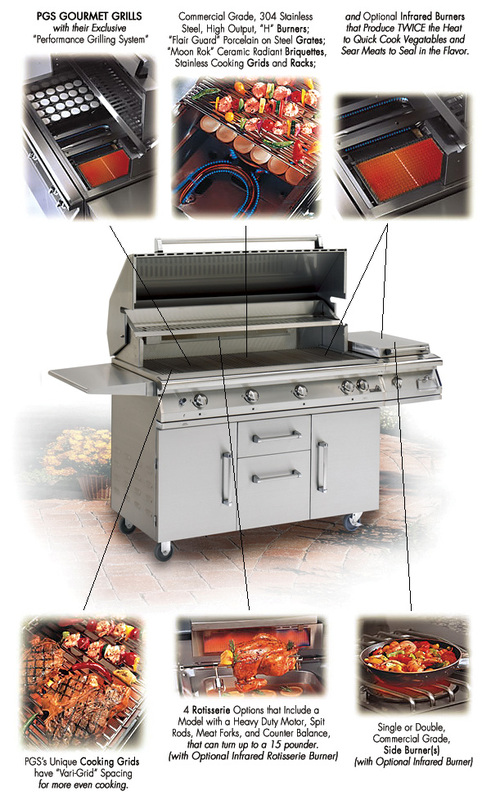 At the heart of our custom outdoor kitchens are the unsurpassed, PGS Gourmet Gas Grills. The founders of PGS were there in the 1960's when the gas grill was invented, and they have spent the nearly fifty years since refining and improving their grills into today's Ultimate Outdoor Cooking Machines. PGS Legacy Series Grills are the finest, most fully featured gas grills available and offer great price value compared to top-of-the-line grills from other manufacturers. You can order your complete PGS Outdoor Kitchen online, using the 10 easy steps at the top of this page. PGS Legacy grills can be mounted on stainless steel carts or in custom masonry enclosures, and offer one of the most comprehensive warranties in the industry. 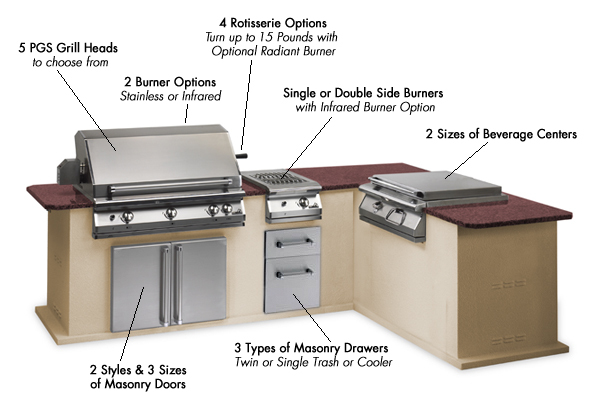 Matching PGS outdoor kitchen options and accessories include: commercial grade side burners, infrared searing and rotisserie burners, beverage centers, heavy duty rotisseries, and a variety of 304 stainless doors, drawers and utensils. Our outdoor kitchen hardware is easy to install, and doing it yourself (or having a handy person or contractor do it for you) will save a considerable amount of money compared to local providers. You can also email us by clicking HERE during normal business hours (10:00 am to 6:00 pm Central Time, Monday through Friday), we can usually get back to you in just a few minutes. We also check voicemail and email periodically after hours and will respond as soon as possible. To purchase PGS equipment at the best price available, please give us a call 512-494-5450.